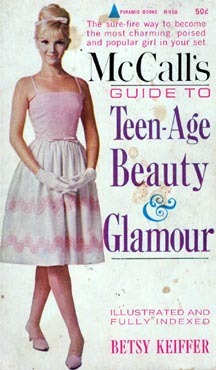 This entry was posted in Books and tagged 1950s, 1960s, Advice, Beauty, Betsy Keiffer, Books, Fashion, Nostalgia, Retro, Teenagers, Vintage. It must be one of those charm bracelets that has cowbells attached to it. What on earth would be so big as to make that much noise?!? I was also surprised by the neckline to the waist comment. I would have thought a dress like that would have been way to risque for the late 50s to begin with.